Sedona Cake Couture: Abby's Birthday Cake!!!! 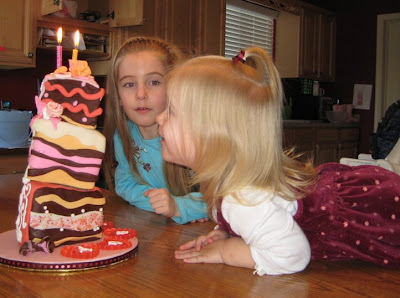 Ever wonder what the birthday cake of a famous cake artists' grandchild looks like? Well, here you go! Andrea Carusetta-Blaut of Sedona Cake Couture created this 3 tiered kid's birthday cake for her grand-daughter Abby's 2nd birthday! In the background is 5 year old Breanna. 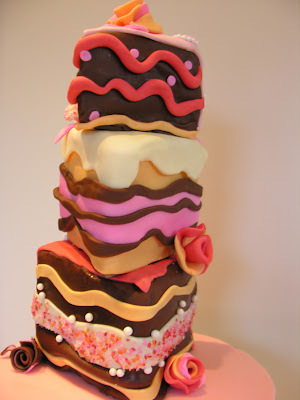 The cake is 3 "slices" of cake that are all decorated up! Inside was her favorite flavor - chocolate! We had to light the candles 3 times because she loved blowing them out so much she kept wanting to do it again and again! Sedona Cake Couture Birthday Cakes with a Flair!